Do you want to know the trendiest colors for the living room design? 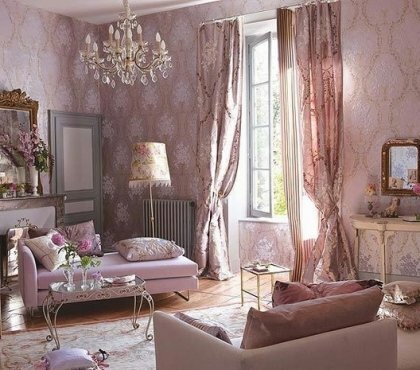 We will show you the extraordinary beauty of the so called “ordinary” gray color, which is one of the most fashionable colors in modern interiors. 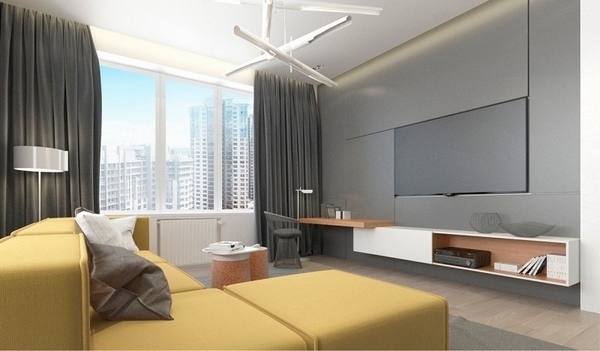 Once you have decided that you want a gray living room, you will face some questions and we shall try to give you the answers for the most successful color combinations, furniture and decorations. Gray combines well with almost any other color. A gray living room is elegant and cool and if you used the right shades and color combinations, you can have a sophisticated, contemporary, traditional or any other style of design. Grey has so many shades, that it may be a real challenge to choose the right one. Anthracite, silver, slate, moss, pigeon, mouse … well over fifty! Deeper and darker shades are suitable for more formal interiors as they are associated with strength. Lighter shades are more elegant, sophisticated and can be used in many design styles. 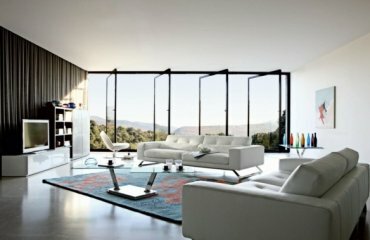 Gray living room ideas – how to choose the style of the interior? 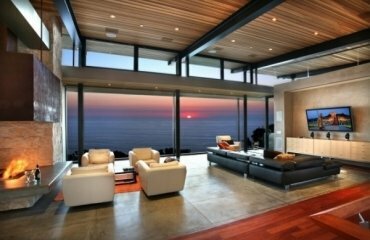 Many gray living room ideas feature contemporary interiors in hi-tech style, minimalist interiors or trendy loft style interiors. 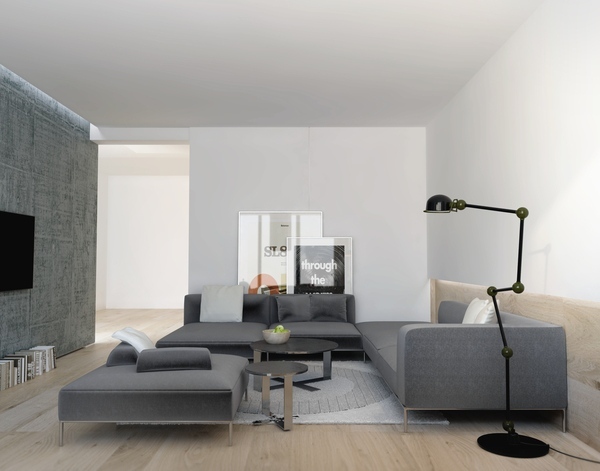 Grey is the color of concrete and concrete walls are typical for minimalism as well as industrial style, grey is the color of asphalt and metal, stone, etc. 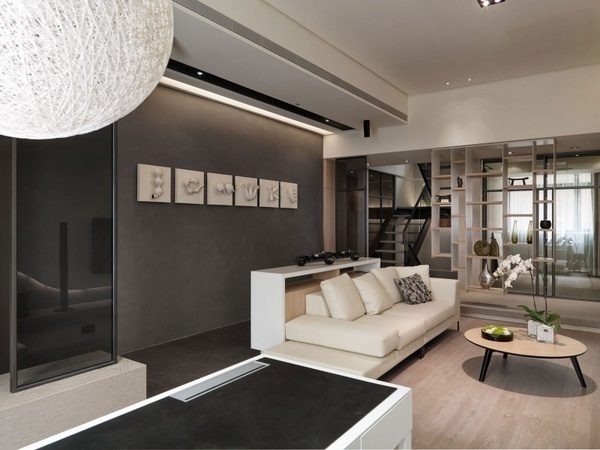 That is why a gray wall in the interior of the living room, complemented by glass, and shining chrome or stainless steel accessories makes the interior trendy and modern. 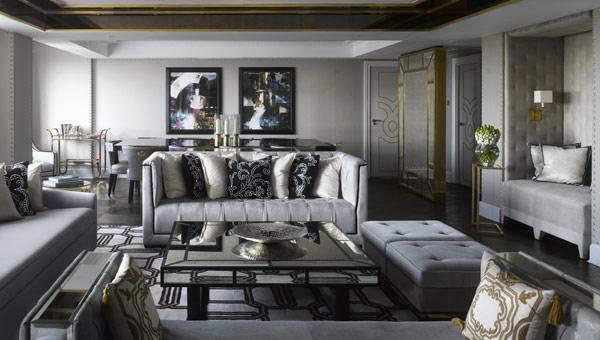 Lighter shades or combinations of two give the room a feeling of warmth, elegance and luxury. Light grey color will serve as a neutral background for colorful and decorative accessories. 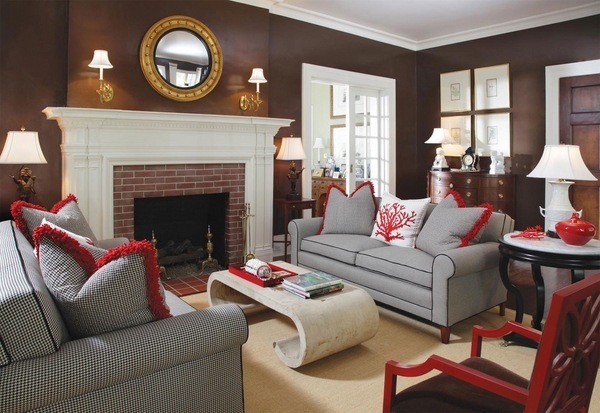 In many gray living rooms, the color is used as a basic color or as a neutral background. 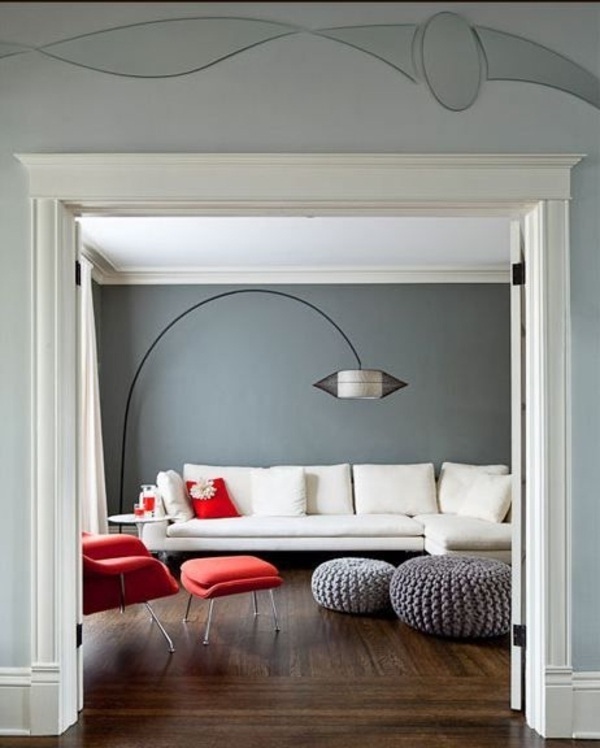 Grey can be introduced in the interior as a wall color, floor or ceiling, or as a trendy sofa, even as a carpet. In this case, the background should be very soft. In fact, gray can be one of the most difficult colors in the interior. 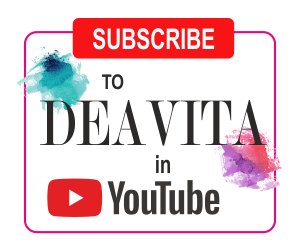 In case you are not sure which shade is the right one for you, it is much better to a specialist as experienced designers will pick the right shade and will combine it with other colors. 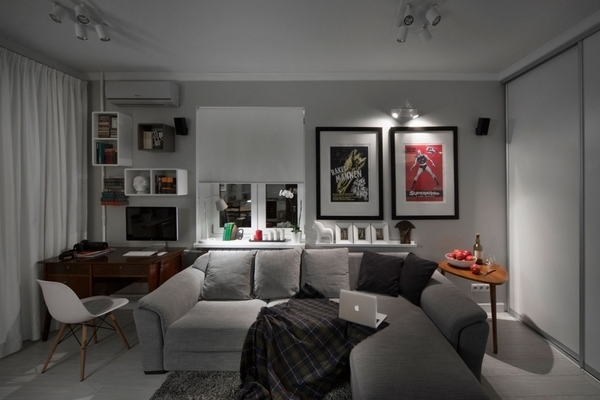 Gray living rooms can look stunningly beautiful even if the space is limited. Again, it all comes to the choice of the right shade and color combinations. It is advisable to choose light shades and combine them with cream, antique white, cappuccino or other soft neutrals. 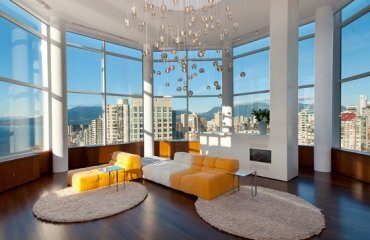 Such combinations visually enlarge small spaces and the rooms look brighter and airy. 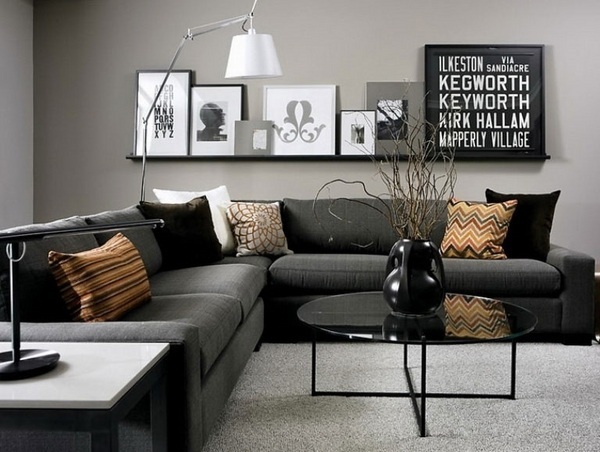 Gray living room walls are the perfect background for elegant and modern interior designs. The walls are like the canvas of a painter and you can take any direction depending of your lifestyle and personal taste. One thing that you should pay attention – shades of gray are not always a good idea. This means that if you have opted for gray living room walls, you should choose contrasting furniture – white, blue, yellow, red, etc. Natural wood or black is also a safe choice. Green plants, ornate painting or mirror frames, rich textures will be the ideal complement for your stylish interior. 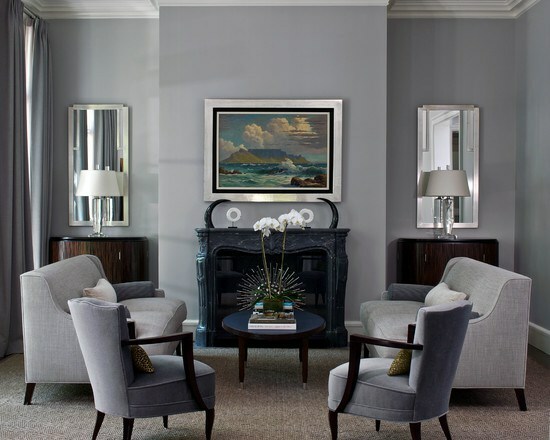 Gray and white living room designs combine one of the ends of the spectrum with the middle. Both colors are used to set the atmosphere in the room and work together quite harmoniously. Although gray and white are considered as monochrome colors, when used correctly, they can create appealing and welcoming atmosphere and the room will look cozy and beautiful. It is a beautiful combination for classic interiors, modern and high-tech interiors, Art Deco, Art Nouveau, etc. Often, designers prefer to use the off-white shades in combination with grey instead of pure white and create spectacular combinations of different patterns and textures – wallpaper, plaster, stone, furniture, flooring, as well as a variety of interesting and sophisticated accents which complement the combination of the colors. 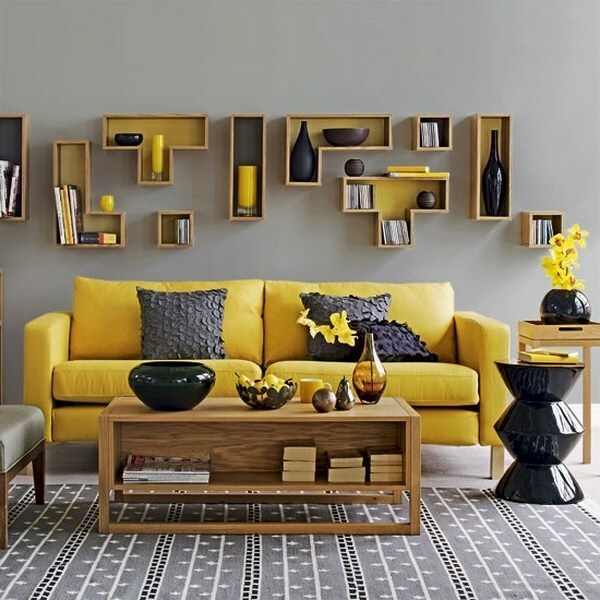 Yellow and gray living room looks fresh and inviting, enjoyable and full of positive energy and optimism. 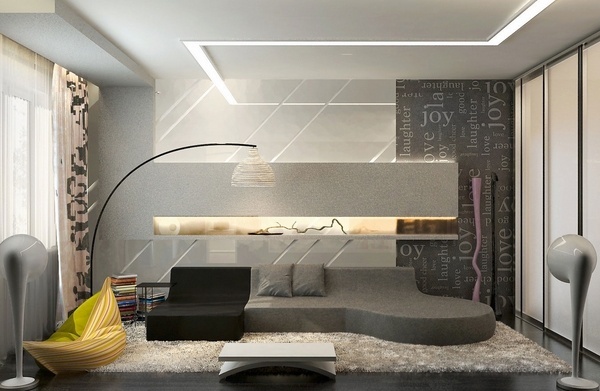 This combination provides the ideal balance between sophisticated and playful touches in the atmosphere of the living room and will reflect the individuality of the homeowners. One of the best ways to create a spectacular combination for the living room is to use the gray as a wall color and add yellow accents – vases, chairs, decorative pillows, curtains and even some fresh flowers to liven up the room. This approach is simple, inexpensive, and you can easily change the color schemes at any time. 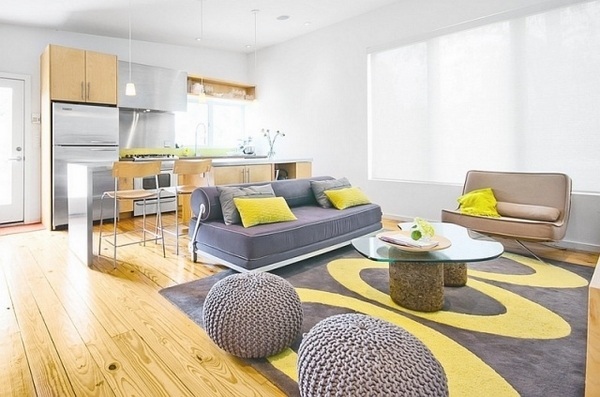 Gray and yellow living room designs look calming and relaxing. Gray has a soothing effect and is ideal for getting rid of the daily stress. Of course, when we talk about combining the both colors in the living room, this does not mean that you have to limit yourself to only these two colors. Add some black or white accents or a few darker accessories which will stand out beautifully and will enhance the two basic colors. It is up to you to decide the proportion of gray and yellow in your interior. 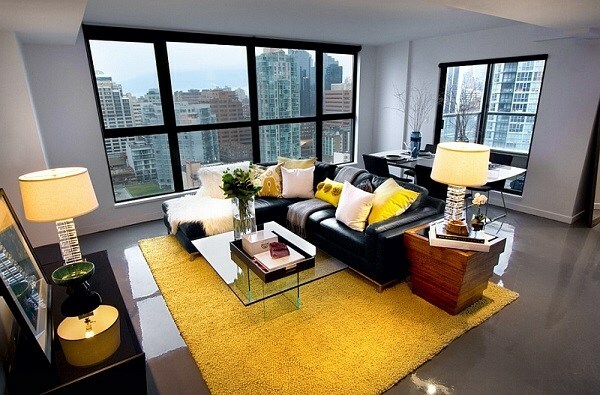 Some people prefer more gray, others opt for more yellow but either way, the interiors look bright and fresh. 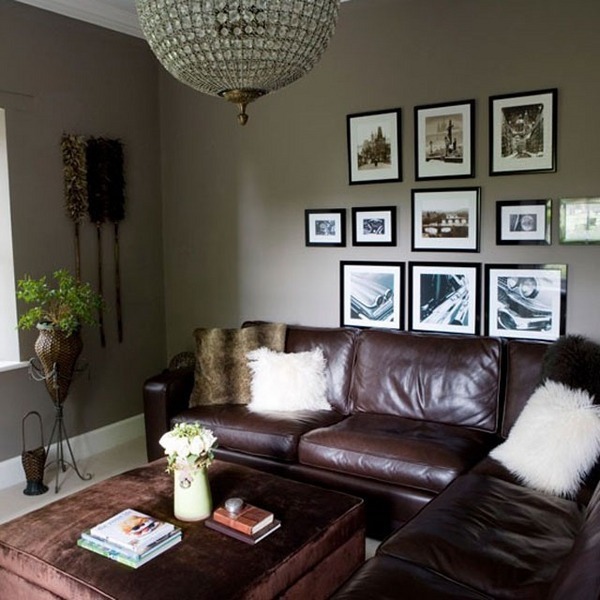 Brown and gray living room interiors most often are associated with classic English country style although the combination works quite well for modern interiors as well. Some believe that it is impossible to combine the two neutral colors while others believe that they can live together in one room and it will look interesting. The combination of brown and grey makes any room really soothing as the colors work harmoniously and although they may seem contrasting to each other, the combination can look soft and elegant. You can choose the contrast principle – dark gray and warm brown or experiment with a soft background and different light brown shades. Many people believe that gray and brown living room ideas are boring but they are not right. This color combination is versatile and of two neutral colors creates usualy fantastic home decors and yet they do not distract you but make you feel at home. 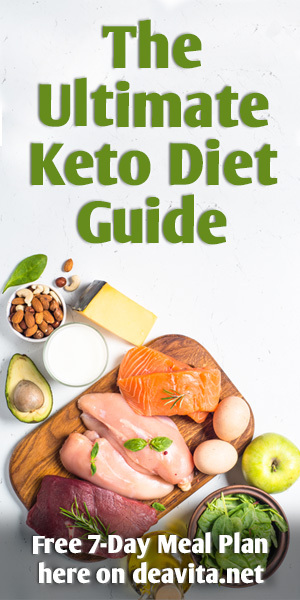 The combination works in various ways – gray walls and wood furniture, brown walls and grey furniture, gray-brown carpet and white furniture will look just luxurious. Gray furniture usually looks more expensive and exquisite and wooden furniture in all shades of this color is a sign of good taste. Gray and blue living room exudes peace and tranquility. 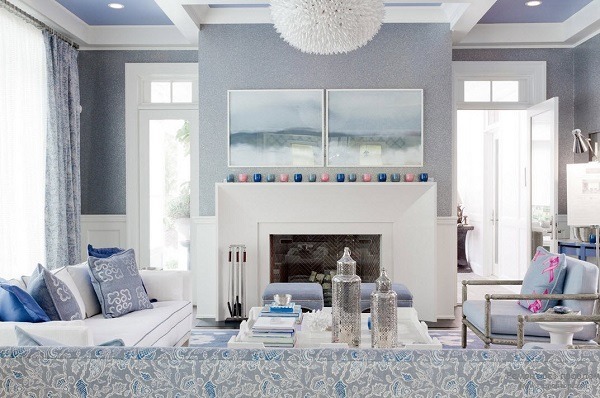 Blue, depending on its intensity, can look soft, welcoming and soothing or rich and deep. Gray walls and blue furniture work together harmoniously, but you need to choose the right shades so that they are not in conflict. 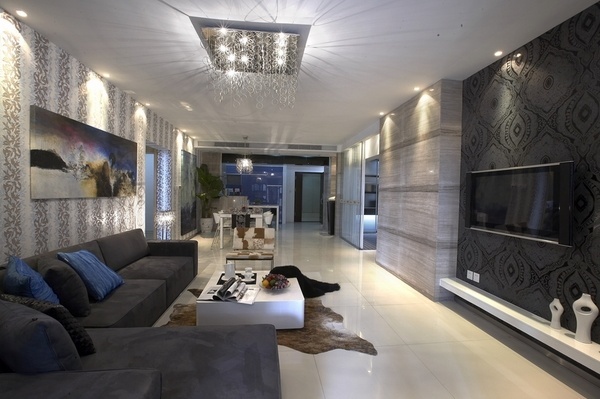 For example darker shades of gray combined with deeper blue can make the interior too cold and even gloomy. The combination of gray and blue works with white, gold and silver as well as with pastel shades. Once you have chosen the gray shades for your living room or the color combination which will reflect your personality you will need to look for the best gray living room furniture ideas. Gray, white or black furniture will be a good choice but furniture in bright colors should not be excluded. For example, a bright blue chair will become an elegant decoration of the room. You can place a bright sofa in front of gray walls of the living room. Be sure to add a few accessories of the same color. Many stylish interiors are created with several shades of grey. The main furniture piece in a living room is the sofa and you can choose it in a dark graphite shade, and most often window curtains complement the sofa color. Homeowners can choose to combine different furniture pieces or opt for a gray living room set. Many furniture stores offer sets with one or two sofas, armchairs, ottomans or stools. 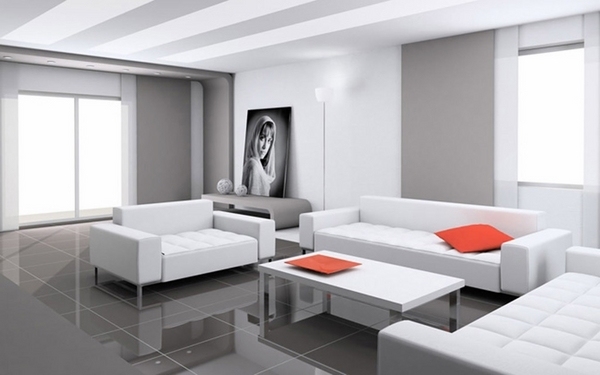 When you choose gray living room set, make sure that you add a complementary color, for example, a white coffee table. Of course, the walls should be painted in lighter hues. Home accessories like decorative pillows, wall paintings, floor lamps, side tables will help you to set accents. Different textures will add depth to the overall design and it will look modern and chic.